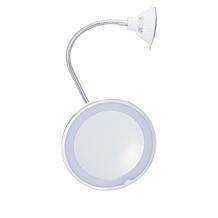 Get ready for your close-up, wherever your day takes you, with this flexible LED light magnification mirror. Stick it to almost any surface for a perfectly portable reflection. The mirror's locking suction cup has to be attached to a clean, smooth and flat surface. 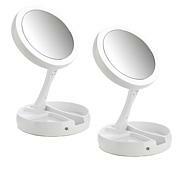 It will work on surfaces such as: ceramic, marble, acrylic, porcelain, enamel and mirror surfaces. If mounting on tile, make sure the suction cup does not go over the grout. 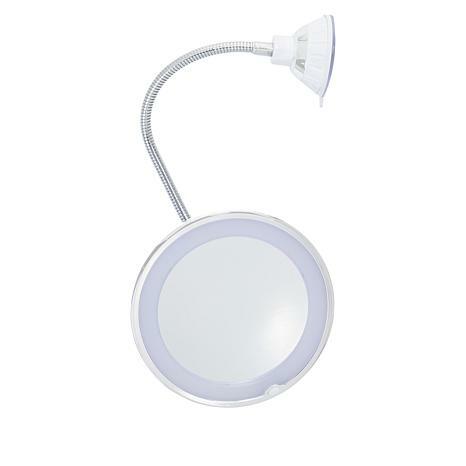 The surface of the suction cup cannot attach to any surface with texture, such as wallpaper, drywall, etc. You can really see everything on your face when you use it. That can be a good thing and not so good. LOL! It's a great mirror. I seen this on tv and wanted to have one for our travels. 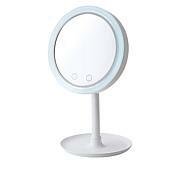 We travel a lot and some hotels and resorts don't have this type of mirror, in which I have one that I use for my makeup. The suction holder is so perfect, no worries of it coming off. The only thing about the mirror I didn't care for that the commerical showed it a lot larger than what it actually is. Super mirror if you can keep one hand free to catch it as it falls over.I'm still debating whether to keep it or not! NuBrilliance engineering department please help!!! I returned this because it just wouldn't stay put to any surface.I was just going to put it on the counter in the master bedroom. It was very secure at first but after about 15 minutes it would come loose and fall over. Good thing I was right there when it happened. Tried several times and it just wouldn't keep the suction. I liked the mirror and the light but it's a real safety hazzard.